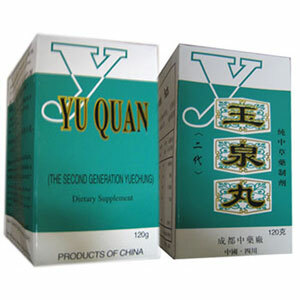 The Yu Quan Pills helps with diabetes (insipid diabetes and sugar diabetes), a disease caused by the disorder of metabolism of carbohydrate and other matters and by the sudden increase of blood sugar. Nourish Kidney Yin, clear Deficient Yin Heat, stop thirst due to Deficient Kidney Yin, promote salivation, relieving fever, alleviating mental uneasiness, vitalizing blood activity, invigorating nervous system, supports appetite, etc. The Yu Quan Pills is chiefly used for the treatment of diabetes (insipid diabetes and sugar diabetes), a disease caused by the disorder of metabolism of carbohydrate and other matters and by the sudden increase of blood sugar. Nourish Kidney Yin, clear Deficient Yin Heat, stop thirst due to Deficient Kidney Yin, promote salivation, relieving fever, alleviating mental uneasiness, vitalizing blood activity, invigorating nervous system, supports appetite. Excess thirst due to Deficient Yin and damaged body fluids, diabetes of mild or moderate severity. Take 6 grams (one level capful), 4 times a day with warm water. One month is 1 course of treatment.